As part of on-going research and development into future technology options, Airbus has signed a memorandum of understanding (MoU) with EGTS International, a joint venture company between Safran and Honeywell Aerospace, to further develop and evaluate an autonomous electric pushback and taxiing solution for the A320 Family. The agreement marks the selection of EGTS International’s Electric Green Taxiing System to be evaluated as a new option on the A320 Family – referred to by Airbus as eTaxi. This option would allow the aircraft to push-back from the gate without a tug, taxi-out to the runway, and return to the gate after landing without operating the main engines. 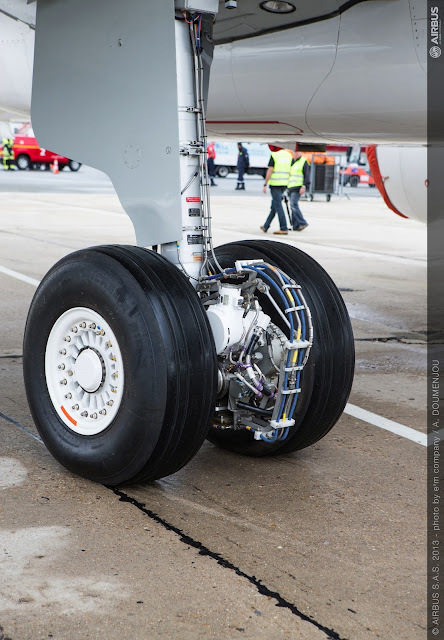 eTaxi will use the aircraft’s Auxiliary Power Unit (APU) to power electric motors fitted to the main landing gear wheels. The architecture will include the ability for pilots to keep full control from the cockpit over their aircraft’s speed and direction during taxi operations. Taxiing-related carbon and nitrous oxide emissions would be cut by more than half. Over the next few months the partners will jointly develop and present a global commercial case and implementation plan to determine the feasibility of an electric taxiing solution for the A320 Family. To this end, Airbus and EGTS International are reinforcing their existing teams to finalize validation studies, define specifications and converge on market requirements for a fully tailored forward-fit and retrofit technological solution. To regularly enhance the A320 Family’s capabilities and performance, Airbus invests approximately 300 million euros annually in keeping the aircraft highly competitive and efficient. More than 10,000 A320 Family aircraft have been ordered and over 5,800 delivered to operators worldwide. With a record backlog of over 4,200 aircraft, the A320 Family reaffirms its position as the world’s best-selling single-aisle aircraft family.